Good news for borrowers looking for mezzanine debt. Mezzanine debt rates came down a bit in 2013. Lenders are seeing more competition for deals these days and are realize that winning means sharpening their pencils. From our view in the market, the decline in mezzanine debt rates in 2013 in a result of a number of forces. There is a large overhang of capital due to new fund formation including a larger number of SBIC’s, Business Development Corporations and private equity mezzanine funds. These funds are attractive for institutional asset managers due to their high current yields and low beta volatility. In a fixed income market starved for yield, many institutions are seeking out higher fixed income alternatives. These funds are realizing that small corporate borrowers, under served by banks, are a vehicle to generate good, stable fixed income returns. Part of decline in mezzanine debt rates 2013 is due to banks coming back to the corporate lending market and providing term loans at low rates. Investment bankers are finding that for the right middle market deal, banks will be aggressive. This forces mezzanine lenders to be mindful of their pricing request for deferred interest and warrants. Mezzanine lenders have a difficult time competing against banks price wise in the term loan tranche. Yet there are a number of strong arguments to make. The value a mezzanine lender brings to a capital structure is flexibility, patience and intelligence. 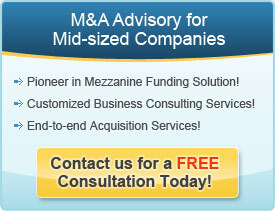 With mezzanine debt rates 2013 at 11% to 12% mezzanine borrowing is more accessible and affordable than ever. This is a great time for acquisitive and growth companies to consider getting into the market.